The old parish church was completed arround 1897, right after creation of the parish. Because of the unstable ground, the church started to develop cracks and parishioners started to think about building a new church. Construction of new church lasted form 1934 until early 1969, when the new church was consecrated. 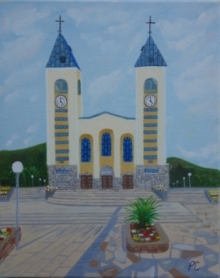 Today, St.James church is the centre and the focus of both sacramental and prayer life, not only for us local parishioners, but also for all pilgrims who visit Medjugorje.